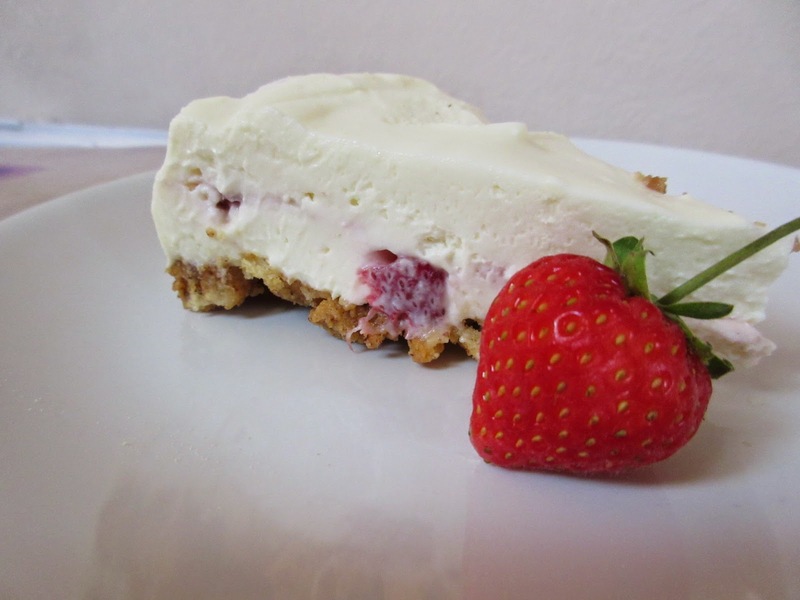 Ah who doesn't love a cheesecake? That's right, everyone loves cheesecake and those who say they don't are lying. Today I was supposed to be having a fun filled solo shopping trip in Birmingham. I did the shopping but it wasn't very fun filled and resulted in only two photos being taken - FAIL. 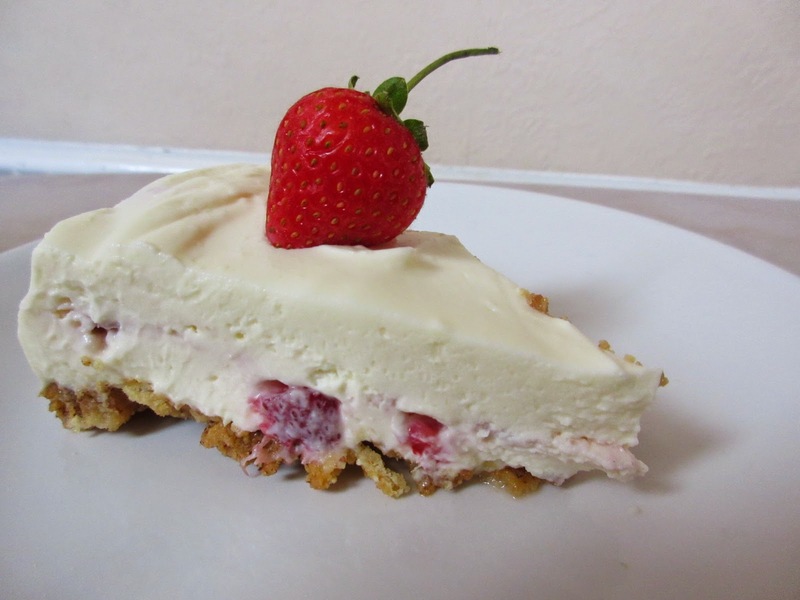 So instead of that being uploaded here is my Strawberry Layered Cheesecake recipe. This is really easy to make and has the added bonus of yummy condensed milk. Tip: Don't forget the lemon juice. You may think the cheesecake will benefit without but oh no it makes it better and surprisingly doesn't taste like lemons. 1 tbsp Jam - I chose Raspberry because that's what was open in the fridge! 1. Put all the biscuits in a freezer bag, or any kind of resealable food bag, and bash with a wooden spoon or rolling pin until they are all broken up. I like to keep some of the pieces a bit big so the base is still crunchy. 2. Mix the almond butter into the biscuit crumbs and combine until all the biscuits are coated. Pour into the base of a tin and flatten with the back of a spoon. Put this in the fridge whilst you do the rest. 3. Mix the mascarpone and condensed milk in a bowl. Keep whipping until it is nice and smooth. 4. Add the lemon juice and stir. 5. Chop the strawberries into a bowl and coat with the jam. 6. Pour half of the cheesecake mixture in the tin and smooth out. Add the strawberries and top with the rest of the cheesecake mix. 7. Leave in the fridge to set for around 2-4 hours then serve. 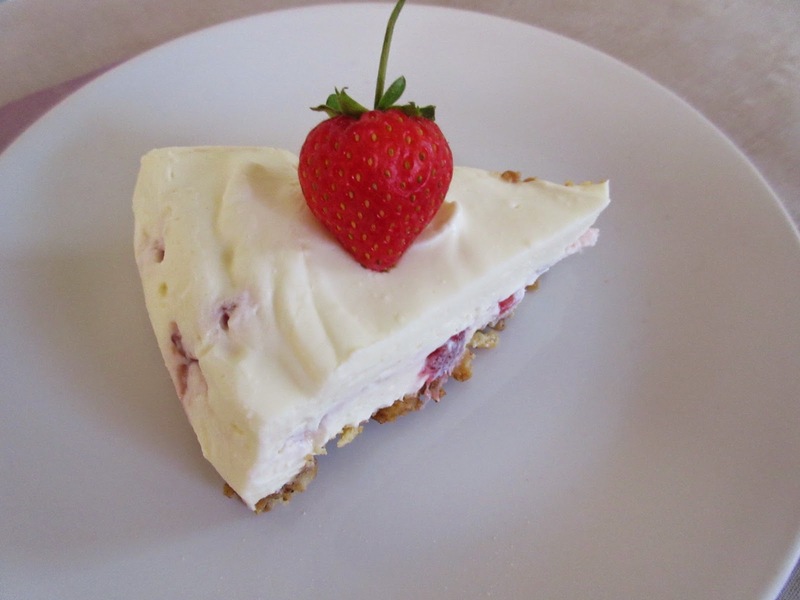 It tastes amazing - I'm going to try a baked cheesecake next time! All content and images © Ellie Kathleen 2015 (unless otherwise stated). . Powered by Blogger. © Ellie Kathleen. Design by MangoBlogs.